Acupuncture involves the insertion of very fine stainless steel needles into the skin. It has been used in China for over 2,000 years and increasingly in Western medicine since the 1970s. Acupuncture may be used to treat a wide range of common health problems and to reduce pain. For example, NICE guidelines recommend a course of 10 sessions of acupuncture for persistent, non-specific low back pain. In September 2012, NICE recognised acupuncture's benefits for migraines and tension-type headaches too. Acupuncture can be combined with other physiotherapy treatments such as exercise, manual therapy and relaxation techniques. It can also be used when other more conventional treatments have failed. When you first see your physiotherapist, he or she will take your full medical history and ask you about your current health problems. You may be asked to complete a 'consent to treatment' form. Between 1 to 10 needles may be used at a time at an acupuncture session. The number of needles used will vary according to your condition and symptoms. The needles are inserted through the skin either at the sites where you feel pain, away from the pain or a combination of both. The needles are usually left in for a few minutes up to 30 minutes. During the treatment, your physiotherapist may stimulate the needles by gently rotating them. This is done to increase the treatment's effectiveness. The needles are removed at the end of the session. You will then be asked to rest for a few minutes before you leave. Acupuncture is one of the many skills employed by AACP physiotherapists as part of an integrated approach to the management of pain and inflammation. Scientific research and clinical evidence have shown that Acupuncture can reduce pain by stimulating the brain and spinal cord to produce natural pain-relieving chemicals such as endorphins, melatonin (which promotes sleep) and serotonin (to promote well-being), to name but a few. These chemicals assist the body's healing processes and offer pain relief as a precursor to other treatments such as manual therapy or exercise in order to aid recovery. Acupuncture is a very safe procedure when carried out by fully qualified professionals. Your AACP physiotherapist is qualified to deliver this therapy and has undergone a recognised accredited training course in acupuncture. The needles used by your physiotherapist are sterile and disposed of after one use. Acupuncture needles are the same width as human hair so having acupuncture does not feel the same as having an injection. The needles are disposable, pre-sterilised and individually packaged. These are often supplied in guide-tubes for easy insertion which means that there is no risk of anything touching the needle during the process. When needles are inserted, you may feel a temporary, sharp pricking sensation. Any side effects tend to be mild and short-lived. They may include: fatigue, light headedness, bruising, localised bleeding or soreness or redness or mottling of the skin around the needle sites. If you continue to feel tired after a treatment, it is recommended that you do not drive or operate machinery. If you have or are concerned about any possible side effects, please speak to your physiotherapist. The use of acupuncture needling for the treatment of pain is supported by an ever-growing body of scientific evidence. Scientific research has examined the effectiveness of acupuncture for various conditions. In recent years, large-scale studies have emerged which have helped to support the benefits of acupuncture treatment. For example it is accepted that acupuncture can help tension-type headaches and osteoarthritis of the knee, especially when used in conjunction with physiotherapy. 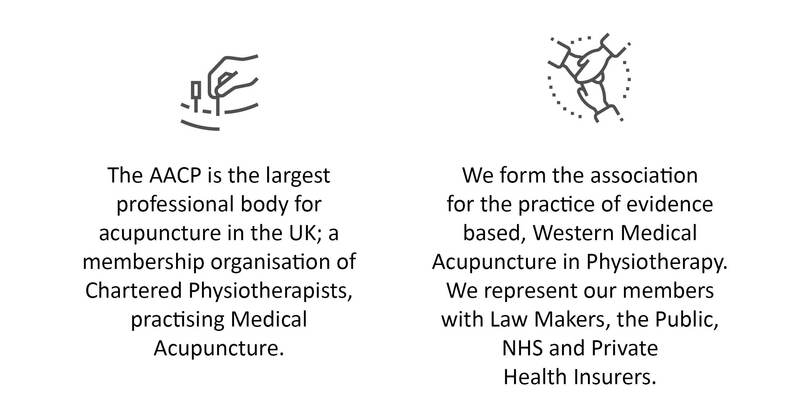 Acupuncture combined with physiotherapy is widely accepted within both the National Health Service (NHS) and private practice. This is evident in the recommendation by the National Institute for Health and Clinical Excellence (NICE) that acupuncture should be available as a cost-effective short-term treatment for persistent non-specific low back pain (source: NICE 2009). AACP members are required to keep abreast of scientific evidence and do so by meeting their Continuing Professional Development obligations. I'm not a Physiotherapist? Can I still go on an AACP course? If you are a Healthcare Professional, but not a Physiotherapist, wanting to learn acupuncture, take a look at our sister organisation, HePAG. HePAG offers Foundation Courses in Western Medical Acupuncture to Osteopaths, Chiropractors and Sports Therapists. WHAT IS ACUPUNCTURE WHAT HAPPENS WHEN I SEE MY PHYSIOTHERAPIST FOR ACUPUNCTURE? HOW DOES ACUPUNCTURE WORK? IS ACUPUNCTURE SAFE? ARE THERE ANY SIDE EFFECTS TO ACUPUNCTURE? IS THERE EVIDENCE THAT ACUPUNCTURE WORKS? I'M NOT A PHYSIOTHERAPIST? CAN I STILL GO ON AN AACP COURSE? Do you have an overactive bladder? Acupuncture may have a role in managing your symptoms.